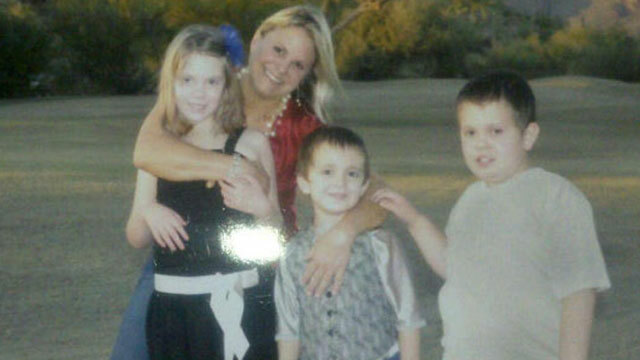 Friends are wrapping their arms around Karen Perry today after the Gold Canyon, Ariz., single mother had to face the loss of her three young children and ex-husband. "You have survived so much already," friend Susan Steele wrote on Perry's public Facebook wall. "I cannot imagine what you are facing. I add my love and prayers to the many you have received. We are all here for you." Perry, who was a pilot and currently works as a flight attendant with Delta Airlines, was described as a doting and selfless mother to her three children, Morgan, 9; Logan, 8; and Luke, 6. Countless pictures of Perry having fun with her three children are posted on her Facebook, including Morgan and a kangaroo, a vacation with Logan in Hollywood and photos of Luke, who loved to pose, hamming it up for the camera. "Such a camera ham," Perry wrote under a picture Luke took of himself. Luke, who was the youngest, suffered from autism. "My male mini me," Perry wrote under a picture of the two of them. Morgan battled epilepsy and faced several brain surgeries. "They were just great kids," Mark Blomgren, principal at the school the two oldest children attended, told the Arizona Republic. "All the teachers were naturally shocked. They cared about them and wondered how their mom was doing and they were just hit pretty hard. Logan and Morgan were just special kids that the teachers really bonded with." The flight between Falcon Field in Mesa, Ariz., and Safford, Ariz., seemed to be a common one for the three kids. Perry posted a picture of the twin-engine plane the children and her ex-husband, Shawn Perry, 39, rode on during that fateful Thanksgiving-eve crash in the Superstition Mountains. "Just loaded up my kids on this turbine commander," she posted on Feb. 4, 2011. "Dad at the controls headed for Safford, AZ." The twin-engine plane slammed into the Superstition Mountains at 200 mph shortly after takeoff on Wednesday, creating a fireball that was captured on video. Pilot Russell Hardy, 31, and mechanic Joseph Hardwick, 22, who was engaged to be married on Dec. 16, were also on board. Rescuers continued their search to recover remains and debris today, which they said was scattered throughout the steep, jagged terrain. "It's a very arduous process, without being too descriptive, because of the explosion," Pinal County Sheriff Paul Babeu said Thursday afternoon. "The remains are being handled with great care and compassion." A team from the National Transportation Safety Board was also on hand today to investigate the crash.